The great scenery continued when we hit the Canadian mainland heading north. 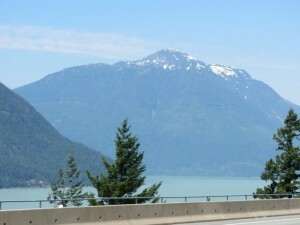 There are a couple of routes we could take and we’d been told both were incredibly scenic but we chose to head into the mountains and go through Whistler on the “Sea to Sky Highway”. The scenery was brilliant – yet again. It seems like around every corner there is another vista to knock your socks off. 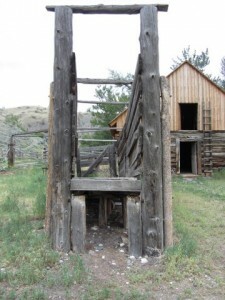 We visited Hut Creek Historic Ranch on our way to meet up with Ken & Carol Duval again at 100 Mile House. 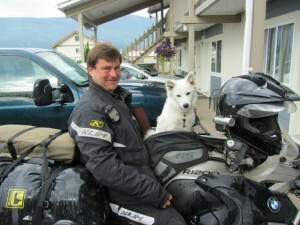 From 100 Mile House we rode up Highway 16 – also known as Yellowhead – through Prince George and on to Smithers. Our camp by the river under the snow-capped mountains was the perfect jumping off point for our ride into the Canadian wilderness, the Yukon and then on to Alaska. 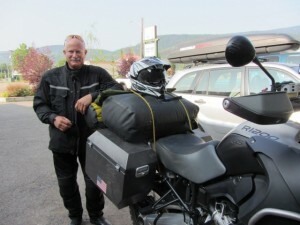 We were expecting our first sightings of bears on the Cassier Highway. 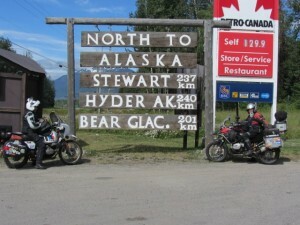 We were a bit like school kids (well, Shirley was) when we stopped at the “North to Alaska” sign for the obligatory photo opp. About 80 kays up the road disaster struck. 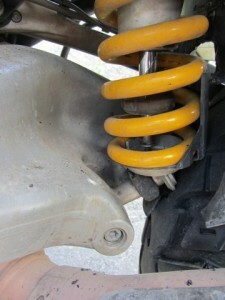 The rear shock snapped! Bloody hell! 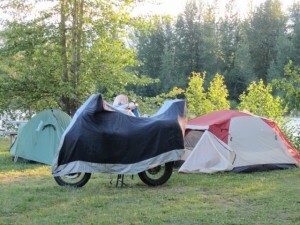 Brian managed to bring the bike to a halt without it spearing us off. Yep – we were in trouble. 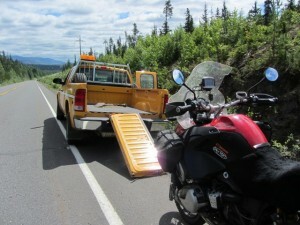 Ken & Carol went ahead to try and get a tow truck. 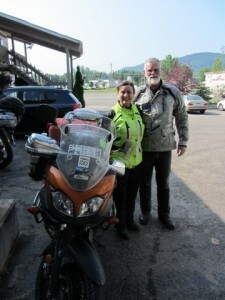 While they were away and we were pondering being stranded on a road in the middle of bear country Sherrie Applegate from the British Columbia Ministry of Transport pulled up. 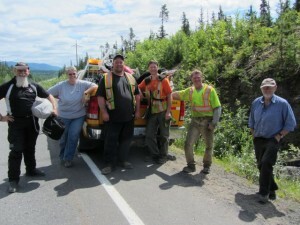 She wrangled a colleague and three road workers, including Wade who could lift the bike on his own, to get it up into her pickup. Four hours later we were back in Smithers…where we waited and waited and waited and waited for a new shock to arrive from Vancouver. While we waited we met other travellers who were either on their way to Alaska or on their way back. It just made us more and more jealous and more and more frustrated. The days just kept mounting up and still no sign of the shock.